When it comes to balance and style, tripod lamp designs have it down pat. Combining a timeless look with the ultimate functionality, these designs are fail proof. Choose a tripod lamp that comes with an easy to use adjustable feature for more versatility. 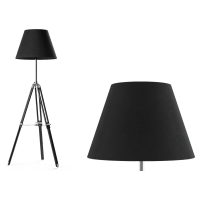 Whether you choose a tripod lamp that sits on the table or floor, these designs will have you seeing the light! Brighten your life with a gorgeous piece of tripod lighting.